The rhythm of the rain on the roof made a pitter-patter sound and the windows were foggy from the moisture when I woke up. We had a quiet morning planned, just me and my daughter. I secretly felt a bit relieved, that I wasn’t going to spend the day slathering sunscreen on my daughter and putting her hat back on every five minutes. I rolled out of bed and pulled my daughter from her crib. When she asked what we were going to do, I excitedly suggested that we do some crafts, which we had not done for some time. That rainy morning was perfect for an art project. After a leisurely breakfast, we wandered into the playroom and my daughter sat down at her art table. “I want to do butterflies!” she announced, and grabbed the butterfly craft set. The kit contained 8 glittery foam butterflies, with 2 foam stickers for each wing. There were pipe cleaners for ears and pompoms for the head and body. The finishing touches were two googly eyes and a nose to make a face. 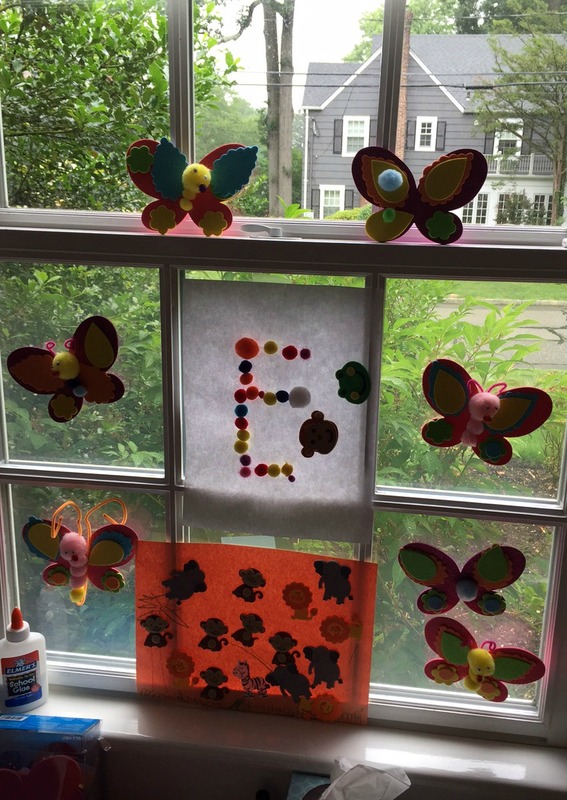 We have made these butterflies before, and several hang on the window of her playroom. My daughter pretty much knows how to make them on her own. But halfway though her first butterfly, she asked me for help because she was having trouble lining up the stickers in the middle of the wings. “It doesn’t have to look perfect,” I insisted, but she continued to pull the stickers off the wings and reposition them until they were as centered as possible. I could see that she was getting more and more frustrated by the minute. I grabbed a new piece of foam and told her that I was going to make a different kind of butterfly. She observed me as I put the stickers in the wrong places and glued pompoms on the wings. So we started making different kinds of butterflies, imperfect ones. 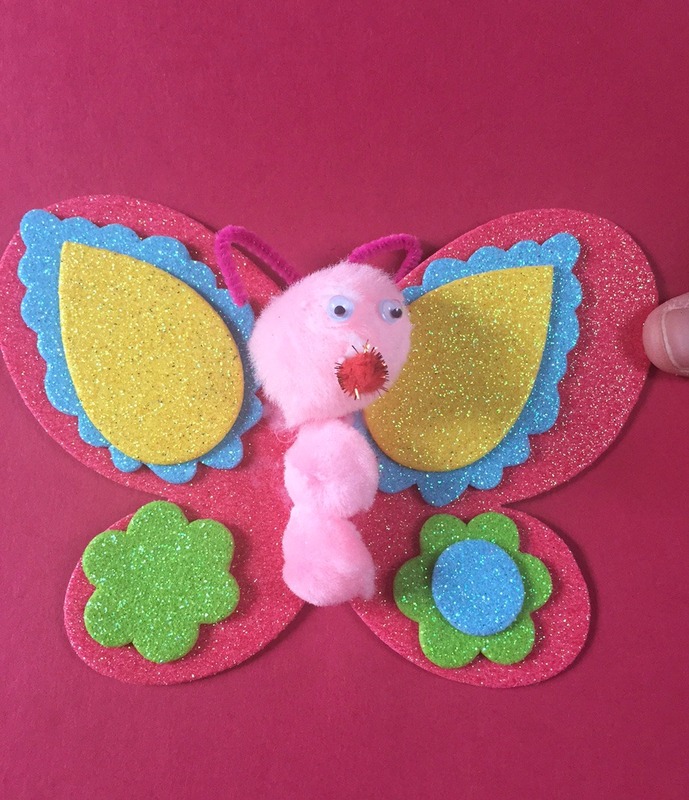 We created butterflies without ears and eyes and pompoms in the wrong places. I encouraged her to put different stickers on the wings. I could see the fight in her – she wanted to make the perfect butterflies, like the ones hanging on her playroom window. She wanted the stickers to line up and the eyes to be in the right places. But I explained that it’s okay to be different and that there are many different kinds beauty in this world. I think she understood. I hope she did. When we were done, we hung up the new butterflies on the window an admired them. Perfect or imperfect, they were beautiful. I noticed that they all glittered the same in the sunlight and pointed that out to my daughter. She smiled and reached her little hands out to touch them. This article originally appeared on Becky’s Blog. Becky Tountas is the creator/writer/and producer of Becky’s Blog, . After career as an attorney, she retired to become a stay at home mom. She is also a certified Holistic Health Coach and an ACE certified group fitness instructor. As a Health Coach, she works with clients to help them implement manageable and realistic lifestyle changes. Her goal is to help clients reach a healthier and happier state through food and lifestyle modifications. She also teaches Stroller Strides and makes her own beauty products. Learn more about Becky at www.BeckyTountas.com.